Saul is a puzzle to many Bible readers. On the one hand, he is Israel’s first king, chosen by God to rule his people and redeem them from their enemies (1 Sam. 9:15–17; 11:11). On the other, Saul is sometimes reluctant to obey God and even becomes outright rebellious (1 Sam. 10:21–22; 13:9–13). What are we to make of this paradox of personality? How does Saul fit into the Bible’s story? What about our stories? Like many characters in the Old Testament, Saul’s life points to greater realities. And over the course of God’s unfolding redemption, those realities find their fullest expression in Jesus Christ. For Saul, this is mostly a study in contrast. That contrast is never more pronounced than in the episode of Saul’s sad and gruesome death. The terrible events leading up to the rejection and slaughter of God’s first king spectacularly illustrate what we might call the two “gospels” of suffering. In 1 Samuel 31 Israel, under King Saul’s command, is at war with the Philistines. In the heat of battle, Israel’s army retreats and is put to the sword. Saul’s sons perish, and Saul is badly wounded. Rather than risk the shame of death by his enemies, the king orders his armor-bearer to finish him off. When the armor-bearer refuses, Saul falls on his own sword and dies. Later, the Philistines strip his armor as a prize for their pagan temple and pin his headless body to a city wall. When his supporters hear what happened, they retrieve Saul’s and his sons’ bodies. First Samuel ends on that dismal note. The Philistine soldiers were overjoyed when they found Saul dead. So they “sent messengers throughout the land of the Philistines to proclaim the good news” (1 Sam. 31:9). The ancient Greek translation uses the same word we find all over the New Testament for “gospel” (euangelizō). These Philistine messengers were literally evangelists of the “Philistine gospel”: Israel’s king was rejected, suffered, and died. This dark episode should prompt us to consider what kind of gospel our own suffering is preaching. As we do, we find several ways Saul’s death anticipates, foreshadows, and ultimately requires the true gospel. Only that gospel leads to resurrection. Despite commanding Israel’s army and ruling as king, everyone deserted Saul in his final hours. The text gives no impression anyone besides the armor-bearer was present for Saul’s final moments. Worse, his final order as king was spurned by his last companion. Even Saul’s trusted armor-bearer refused to obey out of fear, and committed suicide soon after his master’s death (1 Sam. 31:4–5). The contrast is striking: Saul spent his final moments as a forsaken king with a false servant; Jesus spent his final moments as a forsaken servant yet became the true King. In fulfillment of Scripture, Jesus’s closest friends also gradually abandoned him and ignored his last commands (Matt. 26:36–56, 69; Mark 14:27; Zech. 13:7). Like the armor-bearer, Judas—one of Jesus’s trusted aides—could not live with his betrayal and committed suicide out of fear (Matt. 27:3–10). The contrast is striking: Saul spent his final moments as a forsaken king with a false servant; Jesus spent his final moments as a forsaken servant yet became the true King. Badly wounded and facing certain death, Saul wanted a swift death on his own terms. Even when his command was defied, he was willing to take his own life. He would not accept mockery at the hands of uncircumcised Philistines. In contrast, when Jesus faced certain death, he didn’t turn from shame and mockery (Matt. 16:21). He didn’t choose a swift death on his terms, even though it was within his power. Rather, in fulfillment of Scripture, Jesus surrendered to suffering and shame at the hands of his own people. Instead of taking his own life, he gave it for us (Acts 3:18; Matt. 20:28). When the Philistines defeated Israel, God had already rejected Saul for his disobedience (1 Sam. 15:10–35). He was no longer God’s anointed. Instead, he was surrounded by enemies, mortally wounded, and soon perished disgracefully along with many of his sons. His house was almost entirely swept away, and his limited and earthly reign ended abruptly. During Jesus’s day, the nation of Israel was in a similar situation of political oppression, this time under Rome. But God sent Jesus to bring about a final redemption for his people (Mark 1:9–11; Acts 4:27). Unlike Saul, after being captured Jesus didn’t die with his children. Rather, he died for them, and was raised to a cosmic kingship that will never end (Heb. 2:10; John 6:37–40; Eph. 1:5, 2:4–6). After his death, Saul’s followers at Jabesh-Gilead heard what had happened and went to reclaim the body from the city wall. They later incinerated Saul’s body and buried the bones, far from his father’s tomb (cf. 2 Sam. 21:13–14). Israel’s defeat and loss of their king left them mourning (2 Sam. 1:12). After Jesus’s death (which also happened outside the city wall) his followers also sought his body (Matt. 28:1). In contrast, they later found their Lord alive and well (Matt. 28:9; 1 Cor. 15:4). His victory over death left his disciples rejoicing and spreading the gospel of salvation (John 20:19–20; Matt. 28:19). God used Saul’s faltering and temporary reign to herald the coming joys of the eternal monarchy of King Jesus. Bringing the book of 1 Samuel to a bleak end, we see it was necessary but not sufficient for one of God’s anointed kings to suffer and die at the hands of his enemies. 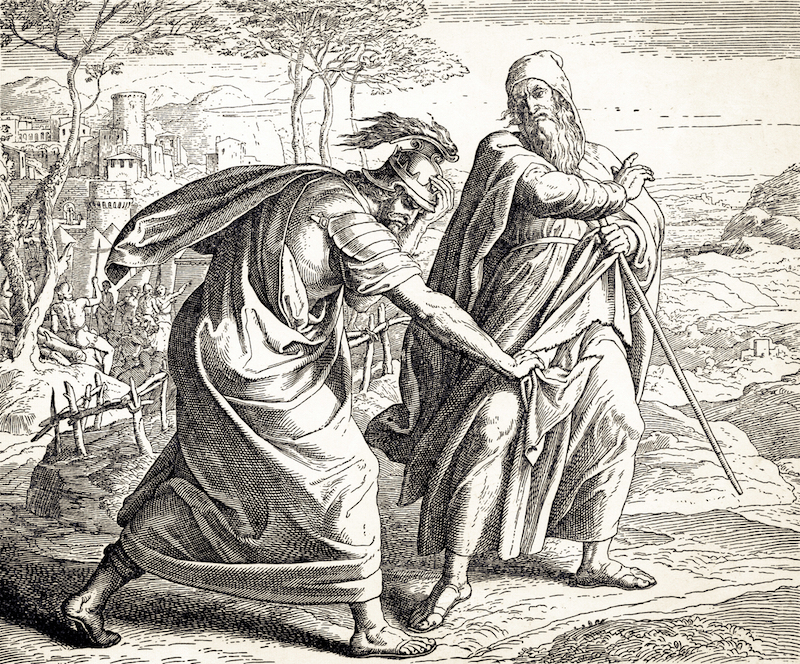 Saul did that, but Israel remained trapped in sin, longing for redemption from both physical and spiritual foes. That’s because Saul was the first in a long line of Israelite kings whose consistent failures anticipated and required something more—another king who was to be like him and unlike him all at once. Saul’s flaws highlighted how God’s redemption must be accomplished by a different kind of suffering king. Saul’s kingdom in Israel was never fully realized, and God’s eternal kingdom in Christ hasn’t been consummated. Our present suffering exists between these two kingdoms and our affliction will build one or the other. As we endure suffering, whatever form it takes, which gospel does our life proclaim? As we are bombarded with illness, conflict, financial stress, and death, we can easily slide toward despair and self-pity. We sometimes prefer to live in a spiritual Philistia of defeat. When we do, we’re letting ourselves think and believe and live as if the King of the universe is dead. But suffering can also prompt hope. The obedience, suffering, and exaltation of Jesus as King will finally deliver us from hardship and misery. In the meantime, suffering peels our eyes away from ourselves. As we turn from despair amid our suffering, we rely upon and proclaim the gospel in hope: King Jesus lives, so we live in him. And his kingdom will never fail. William Ross is a doctoral candidate in Old Testament at the University of Cambridge, where his research focuses on the book of Judges. He recently co-authored the Interpretive Lexicon of New Testament Greek (Zondervan, 2014), and blogs regularly at williamaross.wordpress.com. You can follow him on Twitter.